When you make time to connect, your child learns they are important, loved and cared for. This helps them thrive emotionally and physically! How can you connect with your child? Connecting with your child helps them to feel safe and to trust that they can rely on you for support, love and affection. Spend time doing things together - Let your child take the lead and show you how they want to share time together. 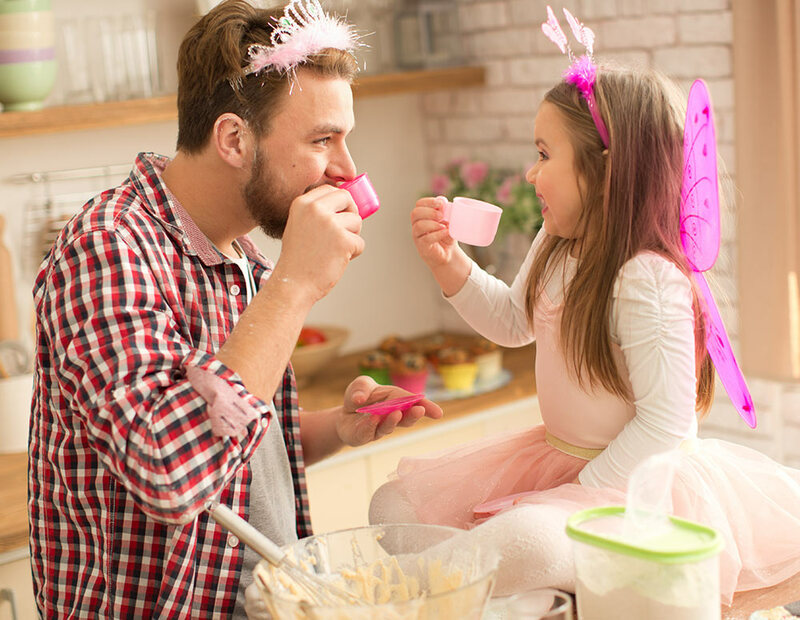 Spending time with your child might involve things like: talking, singing songs, playing games, sports, reading stories or baking something together. Be present - Avoid distractions and give your child your full attention. Try to find a work-family balance by ‘switching off’ from other activities and being present when you are with your child. If you remember something you need to do, try to put the thought aside and make a note to come back to it later. Show affection - It lets your child know that you care about them and develops trust and closeness. As parents we all have different ways of showing affection. Some examples are: giving hugs, kisses, smiling, high fives, a pat on the back or saying things like ‘I love you’ or ‘I’m proud of you’. Praise the things your child is doing well - When you see or hear that your child has done something well praise them. It could be something as simple as: sharing toys, dressing themselves, using utensils well when eating, asking for things politely or playing with others without arguments. You communicate with your child every day. Sometimes it’s just about telling them to put their shoes on or to eat their vegetables! But when we pay attention to and talk about their feelings, thoughts, and needs it becomes ‘positive communication’. It might not be realistic to do this all the time, but small moments of connection throughout the day can make a difference. Talk with your child – Follow your child’s lead around the pace and topic of conversation. Listen and show interest by asking specific questions and waiting for their answers. Talking with your child in an attentive way encourages them to be more open and share more with you. Be attentive – Pay attention to your child’s body language, their emotions and what they say. By noticing these things it helps you to understand and be there for your child in a way that matches how they feel and what they need. This is called ‘tuning in’ to your child. You may start to notice patterns and personality quirks. You can also figure out what your child needs and when they need it. Recognise and respond to feelings – Ask your child about their feelings and listen without judgement. This helps them to feel heard and cared for. Talk about how you and other people feel too. It can help your child to become more comfortable talking about and naming their feelings. Listen – Show an interest in what’s going on for them. Work together to come up with ideas or solutions to a problem they may have. Show that your child’s ideas and what they are saying is important to you. Communicate clearly – Try to be honest and real about your own feelings. This means you aren’t sending mixed messages that can be confusing eg. saying one thing and doing another. Actions can often speak louder than words. It can be helpful to explain to your child if something goes differently than how you said it would. Set an example of positive and respectful communication – Listen and talk with your child in a calm and caring way even when setting boundaries or using discipline. Show respect for your child’s point of view and their needs. Role modelling caring and respectful communication helps your child learn how to do this with others. As a parent we can sometimes forget to take care of ourselves. It might feel too ‘selfish’ to take a break or do something nice for ourselves. But giving yourself a break and looking after your wellbeing helps you to be a better parent. Taking care of your wellbeing - also called ‘self-care’ - can help you to be more present when you are with your child. Here’s our self-care tips to get you started. But feel free to come up with your own list! It’s ok to spend time alone doing things you enjoy that’s just for you! Feeling overwhelmed at times is natural and lots of people find parenting challenging. Finding time to connect with your child in a meaningful way is hard when you’re under pressure, stressed, tired, unwell or just busy. Need some guidance around what else you can do to connect with your child? Give us a call on 1300 30 1300 (QLD & NT) and speak to one of our trained counsellors.